The temperature of the seawater around Antarctica is rising according to new research from the University of East Anglia. The international research team say that this has accelerated the melting and sliding of glaciers in the area, and that there is no indication that this trend will reverse. It also reveals that other Antarctic areas, which have not yet started to melt, could experience melting for the first time with consequences for sea-level rise. Prof Karen Heywood, from UEA's Centre for Ocean and Atmospheric Sciences, said: "The Antarctic ice sheet is a giant water reservoir. The ice cap on the southern continent is on average 2,100 metres thick and contains about 70 percent of the world's fresh water. If this ice mass were to melt completely, it could raise the global sea level by 60 metres. That not going to happen, but it gives you an idea of how much water is stored there." "Accelerated glacial melting in this area has been observed for some time, causing a major contribution to rising sea levels worldwide. We have shown how oceanographic changes over the last half century are likely to have caused this melting." The water around Antarctica is also shown to be getting less salty, which is consistent with more ice melting from the Antarctic continent. The research reveals that more warm water is being transported towards the ice. This accelerates the melting of glaciers from below and triggers the sliding of big glaciers towards the sea. Antarctica is a cold island in the middle of a relatively warm ocean. The research has shown that the warm water in the deep ocean is getting shallower in many places around Antarctica. This means that it is easier for this warm water to get close to the ice shelves by reaching the shallow seas around Antarctica. The southwestern Weddell Sea is a colder area where a large-scale melting of ice has not yet happened - and is one of the areas where this warm deep water is getting closer. 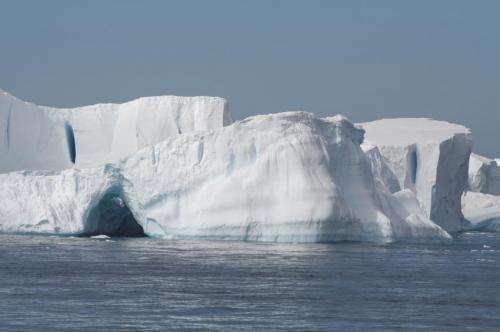 Professor Heywood explains "Although many of the large ice shelves buttressing the Antarctic ice sheet are not yet melting, the source of warm water seems to be getting closer, so these ice shelves could begin to melt in future which is worrying in terms of global sea level rise." There are other implications of higher seawater temperatures around Antarctica. Ocean biodiversity could also be affected - for example the spawning cycles of Antarctic krill, which play a key role in the Antarctic food chain, could change in warmer conditions. Conflicting news everyday. Sea water temp is rising but the sea ice is expanding and the ice is unbelievably thick. Settled science. You have trouble understanding what you read. That the Earth is warming is settled. That it is the result of man-made CO2 loading of the atmosphere is settled. The effects of this settled science is what makes these studies both important and interesting. It's too bad you don't understand how science works. It is really interesting stuff, once you set aside your politically motivated naivety. No. Unless you are easily influenced by idle propaganda - this is why EDUCATION is SO important, U have been here since May 15, 2012, did U bother to advance your education in Physics even a little - if not why r u still blurting nonsense ? Who manipulated U to claim it was "unbelievably' thick, is that a reflection on your gullibility ? Did U measure it, if not then show us WHO did - where & when please or STFU ? "How can adding a greenhouse gas such as CO2, with Known thermal properties of re-radiation observed for >100years, to the atmosphere NOT increase thermal resistivity ?" Why R U here - R U paid to obfuscate & be a d..k, sold your integrity, your humanity too ? Deny U R paid then to be a d..k ? Try reading the science again my friend and this time engage the brain. And just what have I been saying? Heat melting ice, what a surprise. It is what I've been saying for 30 years, indeed since I got to the site. Melting ice, temperature effects are secondary. What a complete load of BS The Man made is a complete lie and proven so more every single day...You cannot lie your out of it anymore! Maybe you should read up more and post less! Your idiotic lies are out of date! I don't need to "read up" my friend. I'm a (retired) Meteorologist. And what's your qualification to justify your evidence-less hand-waving. Coz that will do it every time won't it? Ignorant denialist statements vs empirical science. Actually I reckon you're the first person to deserve a ^3 at the and of that. Thank you for not even attempting to provide evidence for your moronic claims. It allows the rest of us to discredit you even faster. Just go ahead and read the article. I'll cite it directly for my moronic claims. As for the 30 years, or since I've been on the site. Well, I used to be The Alchemist (I assumed this account). the 30 years-? I can't prove that, but if you could see the scars. Arguing with environmentalists saying temperature was second fiddle to Ant/Arctic melt, saying temperature absolutely would not go up 4C by 2012. Saying CO2 was a red herring, but fossil fuels contribute about 1/10000 the Suns energy. Predicting climate change, and having people very like those on this site ignore and deny the predictions. Ah, I must be crazy. can you refute any of these yet with equivalent studies from reputable peer reviewed sources? "The work of Dr. J. Marvin Herndon has been entirely dismissed since he first published in 1992---"
It was rightfully dismissed. His ideas were wild conjecture, without a shred of evidence or plausible physics. ..This is not so illogical in the my global warming model, in which most most of heat comes from geovolcanic activity and decay of radioactive elements in marine watter accelerated with dark matter. 1.Therefore you must claim geovolcanic has NOT already been accounted for, where is your evidence for this ? 2. U worked out from your model heat in Joules & over what region ? 3. U accounted for glacial ice mass loss due to heat flow re 2.? 4. U factored in specific heat of water ? 5. Nuclear equation - which radionucleotides; K, Th, Cs, which species ? 6. Can u point to decay chain products re 5. & evidence ? Surely only if U can answer key questions above esp re HEAT quantification ? Arguing with environmentalists saying temperature was second fiddle to Ant/Arctic melt, saying temperature absolutely would not go up 4C by 2012. How climatologists were claiming there would be "..up 4C by 2012" AND from what starting point ? U claim U said it wouldn't, seems like an ambit claim for self-esteem because U have NO evidence of any reasoned model, no 'pause' prediction ! High school students, if they understood their physics KNOW specific heat of melting ice is extremely high so it's OBVIOUS glacial ice melt & subsequently oceans would NOT show much heat rise at all but, when & why ? Claiming u guessed 30 years ago makes u equal with high school students, yet u proclaim it as central to your model, should that be credible ? Key word being "was" so NOW u accept it is central to heat retention by virtue of added thermal resistivity ! One wonders; why pay shills to post illogical and unsubstantiated garbage on EVERY article reporting about Climate Change? It is simply to control the narrative. The goal is to merely disrupt meaningful discussions about the data and its place in our growing understanding of the climate situation. Then how did those global warming activist get frozen(ICED in) and it needed 3 icebreakers to free them. It's empirical science sunshine, and if you had the wit about you common sense would tell you it's irrefutable. But no, we resort to ignorant hand-waving. Making the universe dance to your tune is rather desperate my friend. I would suggest that the universe doesn't really know of your existence, let alone is likely to alter it's laws for you. The Media can't keep up with which Establishment lie to publish. Today on Yahoo there are 2 conflicting sets of stories--one that Antarctica's melting at 3 times the blahblahblah, and another that Antarctica has record-breaking ice. Someone needs to create a singular source where the lying media can go to be told what to write. Otherwise the scam will never succeed. I'm betting you didn't see any story about "record-breaking ice" in Antarctica. You almost certainly saw a story about record breaking Antarctic sea ice, which is a very different thing. If the story was complete, it probably mentioned how global warming is contributing to that record breaking sea ice. Another one who needs to engage the brain. Err, the meting bit is land ice. The growing bit is sea-ice, which still entirely melts back in the SH summer. Has it ever occurred to you that winds blow sea-ice. That the sea is saline. That it is becoming less salty due the land ice melt, and therefore more easily frozen. No of course not, those facts would interfere with your bias, even if you could process them. As someone said somewhere "Evil has an easier chance to win if good people ignore evil deeds & do nothing about them" - or words to that effect. Do we want majority of uneducated easily led rednecks/bogans to have a greater voice than those educated who understand physics & have reviewed the evidence ? Its the squeaky wheel paradigm but in more complex guise & seems to be driven by commercial agenda of those companies that don't want to change their business model by reducing fossil fuel use as they think that means less income, few million for propaganda is so easy to find. Lookup Exxon income. MM: I assume you are looking for the quote: "All that is necessary for the triumph of evil is that good men do nothing." which is attributed to Burke, but the attribution is disputed. I want to support the work that many of you do to make sure that those who are looking at the dialog do not get the idea that the deniers are right. You, Stumpy, Runrig, and others have spent the effort to make sure the deniers do not get off without being shown to be ignorant. Keep up the good work. At $60 per barrel oil fracking is dead, Tar sands are dead, deep water drilling is dead. Coal price has slumped, China's economy has proven to be one huge ponzi scheme. So I wouldn't pay no mind to those. However, I object to you casting aspersions against us Rednecks. Please apologise. Water_Prophet, this is a VERY simple issue, WHY do U ignore it & look intellectually feeble ?